Asked at National Journal‘s Election Preview on Tuesday whether he thought the party might name a vice presidential candidate like Sarah Palin, whose addition to the GOP 2008 presidential ticket excited conservatives — but also turned off independent voters — Black argued such a pick won’t be necessary given the current crop of presidential candidates. I didn’t miss Governor Palin’s October 5th announcement on Mark Levin’s show, so I know she won’t be seeking the Republican nomination, but let me just say this as bluntly as I am able: Sarah Palin is precisely the sort of candidate the Republican Party desperately needs, not merely as the VP selection, but in point of fact, at the top of the ticket. I realize that Palin’s announcement means I won’t get my wish, but I’d like to take the opportunity of Black’s answer both to refute the notion put forward as a construct, and to refute Black’s evaluation of the field, but part of doing so is going to require that I revisit what we’ll be missing in this campaign season without Sarah Palin’s entry. The first point to understand is that the premise posited by the question is false: Palin did not “turn off independent voters.” The simple fact is that McCain’s candidacy failed because he suspended his campaign just as Palin’s impact was really being felt. The truth is that McCain couldn’t motivate the Republicans’ conservative base, and that is what doomed his campaign, so this entire premise is a lie. It’s simply dishonest, and former McCain campaign officials have grudgingly admitted this to have been the case: They did far better with Sarah Palin than they could have done without her. Examining Black’s answer, I’m led to the conclusion that he is as out of touch as anybody in the GOP establishment. To suggest that we don’t have a moderate running is to pretend that Mitt Romney is a staunch conservative, and that’s as preposterous as the suggestion in 2008 that McCain was a conservative. In 2008, conservatives had been looking for the non-McCain, because they recognized him as too moderate, and too willing to to saw off limbs behind real conservatives, but now they seek the non-Romney candidate because they rightly realize that Romney’s positions are roughly as solid as the intergalactic void. Black’s pretense that the Republicans won’t need “ideological balance” is merely a play to get us to ignore the reality: Romney is no conservative. Not yesterday, not today, and not tomorrow. If he was perceived as conservative, he wouldn’t be hovering in the 25-30% range in the national polls. No, if Romney is the nominee, there will be many conservatives who decide to stay home, just as there were in 2008, and it is this for which McCain was forced to find a solid conservative like Sarah Palin as his running mate. Assuming momentarily that he were to win the nomination, if Romney picks a fellow moderate as his running mate, you can expect a land-slide victory…for Obama. Let’s be honest about something else, however, and it’s this attempt to paint Sarah Palin as a hard-right conservative. The evidence of her gubernatorial record is not that of a doctrinaire right winger. While considerably more conservative than a Romney or a McCain, it wasn’t a strict adherence to conservative ideology that made her such a force in 2008, and again in 2010, when campaigning on behalf of others under the Tea Party banner. 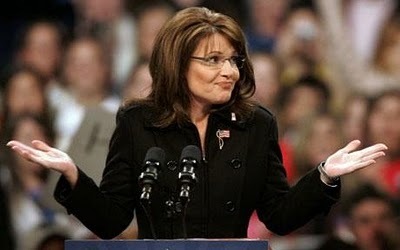 What Palin brought to the ticket was something that none of these candidates really possess, and that is the record of a real outsider, somebody truly from beyond the beltway in virtually every way, who brought an honesty and sense of duty to the country to McCain’s flailing and floundering campaign. Not all political virtues come down to the sort of considerations Charlie Black ponders and weighs. He’s an insider, and a part of a political establishment that knows only wins and losses, and cares little for ideology, or in truth, even for the country. To him, a candidate like Palin possesses some sort of voodoo magic he can’t comprehend, and it is by this failure to perceive reality as it is outside the Beltway that the Republicans now risk losing in 2012 to Obama: They don’t “get” Palin’s appeal. They never have, and they probably never will, much as while so many of them now pay lip-service to Ronald Reagan, they didn’t understand what conservatives found so appealing in a populist who spoke plainly about the state of our nation and our world. To these hucksters and hacks of the permanent political class, it just doesn’t add up. The reason Sarah Palin had been so appealing was not because she had been perfectly conservative on every issue so much as because she showed integrity in carrying out her office, and a simple devotion to the principle that she was elected to serve her state and its people, but not the entrenched interests. More, she showed a willingness to work across the aisle where it was possible, and put the hammer down when it was not. At the height of her term, she had approval ratings in the range of 80% or more, so that the only the rabid extremes at both ends of the ideological scale actually disapproved. In this sense, Palin was a moderate insofar as the way she governed, not so thoroughly tied to a party doctrine that she was inflexible. What she did do was something rather more marvelous and unique, and that was to embrace her role as an earnest servant of the people. Despite leftists’ hankerings for a scandal, this is the truth that over twenty-four thousand emails revealed to a disappointed but undaunted press bent upon her destruction. What Charlie Black and those like him seem not to recognize, or worse, to intentionally ignore, is that Palin’s best virtue is her own personal character, and how it directed her actions as a politician. In speeches, in interviews, and in notes posted on Facebook, what Palin has revealed to those willing to notice it has been a wonderfully earnest person who believes in the power of individuals, and the rights of people everywhere against the tireless aggressions of the state. This is what conservatives noticed about her in 2008 that brought a renewed energy to the McCain campaign. This is what brought conservatives out to the polls to the degree they appeared at all. Had McCain not foolishly suspended his campaign, things might well have gone differently, and had his campaign been more willing to contest every state rather than writing some off, it might have been salvaged. There’s really no way to know for sure, but this much is true, and you can take it to the bank, and while Charlie Black can’t plot this on a chart, it’s something he might want to know: There is nothing the Republican party needs more desperately than Sarah Palin. The Republican party is dooming itself to four more years at least in the Presidential wilderness if it selects another moderate of the mold of Dole, McCain, or Romney. The problem is really very simple to understand once you step outside the Beltway and look at the state of our country without a cocktail in your hand. We suffer from a lack of courageous leadership in the form of a populist conservative, and there is not one in this field, as now composed, who effectively offers to fill that void. We have a lot of candidates, all with their own potential virtues, but none of them possesses that element most critical to our country’s current morass, and it’s simply and clearly what Sarah Palin had prospectively offered, had she entered this race: Clear-cut messaging, earnest presentation and delivery, and common-sense conservative leadership based in the values upon which this country had been built. If it weren’t for the fact that the GOP establishment seems incapable of grasping this concept, the GOP might have a chance in 2012. For conservatives, I ask only this: Do you need a perfect candidate? I believe most would tell me they don’t expect perfection, but only perfect diligence. It’s one of the reasons that despite the questions over WMDs in Iraq, George Bush was able to overcome Kerry in the election of 2004: Whatever his other failings, people believed he was generally earnest, and cared about the country. We can differ over whether he had been a real conservative, and I would contend he hadn’t been, but the fact is that in conservative America, where elections are really won or lost, it is not over some notion of ideological purity, or some Beltway calculus about “ideological balance” on the ticket, but whether conservative Americans are roused to show up at the polls in support of a candidate based on their estimation of his or her character, and their earnest commitment to live by it. In short, it comes down to trust. Conservatives don’t and won’t trust Mitt Romney. They look at Romneycare and wonder about his statist reflexes, and his compromising, waffling ways. They like Newt Gingrich at times, as he’s clearly at an intellectual advantage in many of these debates, but Gingrich has shown over time that he can be flighty too, and questions about his personal conduct are always resurrected as a matter of trustworthiness. Rick Perry suffers from his own crony-capitalist problems, and at times, his positions have left Texas conservatives scratching their heads at the question as to whether they could trust him. Herman Cain is a great motivator, but some of his positions, and frankly, his lack of understanding on some issues of critical import make some conservatives wonder if he can be fully trusted. Ron Paul suffers the same problem on matters of national security and foreign policy, for while Americans very much wish to avoid being the world’s policeman, they also don’t wish to abandon longstanding alliances and our defensive posture on a global scale. Michele Bachmann also seems to suffer this problem, but it has less to do with trusting her on specific issues as it does in trusting her ability to lead. Trustworthy leadership is the trait conservatives crave, with a bit of populist understanding of the issues at hand. They want a candidate who isn’t afraid to be called a conservative, but who instead counts it as a badge of honor. They want a candidate who possesses the strength of character to serve the nation, as a conservative, without flinching at the endless harangues of the leftist and establishment press. They want somebody in office who will make proper compromises, but whose reflex isn’t to cut a deal at the first sign of controversy. They want a president who knows how to make cuts and instill budget discipline in good times as well as bad. Rather than seeking to neutralize the Tea Party and the conservative wing of the Republican party and Independents, the GOP should embrace them, because what they really want is an earnest servant of all the people, who they can trust, and whose first and last thoughts of the day will come down to God, family, and country, just like their own. In short, what Mr. Black misses is what conservatives in flyover country know almost instinctively, and recognized immediately upon hearing her speak on the national stage: There is nothing this country needs more in the White House than Sarah Palin, conservatives and Tea Party folk know it, and it’s a damnable shame that the Republican establishment doesn’t understand why it’s akin to a national tragedy that she won’t seek that office in 2012. O4P-CA: Volunteer to Restore America Today!